Grimspound. The name conjures an unrelenting bleakness. In the remains of this medieval settlement you can imagine the winters were harsh and unforgiving. 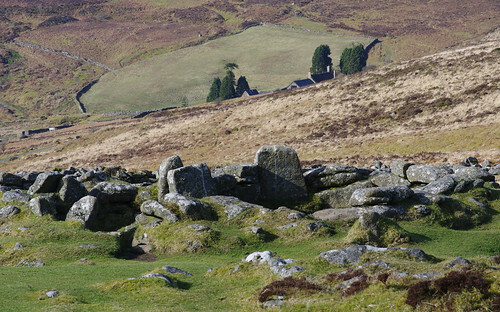 Situated a couple of miles above Widecombe-on-the-Moor, Grimspound is a circular wall with four openings and the remnants of huts inside. No doubt life was hard for its occupants, huddled together against the elements. But there is nothing haunted or harrowing about Grimspound. Today, the place is popular with visitors and mountain bikers resting between hills. But first there is the small matter of getting there. There is a small car park a few hundred metres along the road. We gather our warm stuff together and head off up the hill. I have developed the annoying habit of leaving my gloves behind when I most need them. At the top of the hill we turn right - straight into a bitter wind. Sudden blasts of air catch open mouths unawares. Lady looks like her fur is ready to fly away. 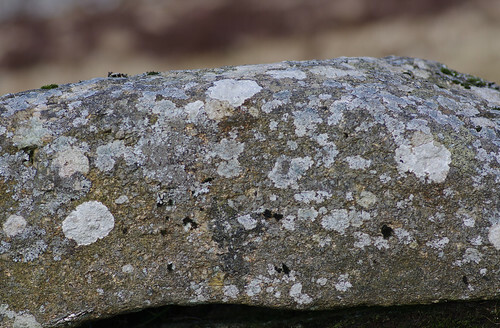 Thankfully, the rocks of Hookney Tor are not far off and provide our first stop. For a while we shelter in nooks and Sherry snaps away at the strange, crustose forms inhabiting them. Out of the wind's reach my thoughts turned to those human ancestors and were formed a respect for the hardiness of people who did not have the luxury of windproofs and waterproofs but just got on with the job of survival. 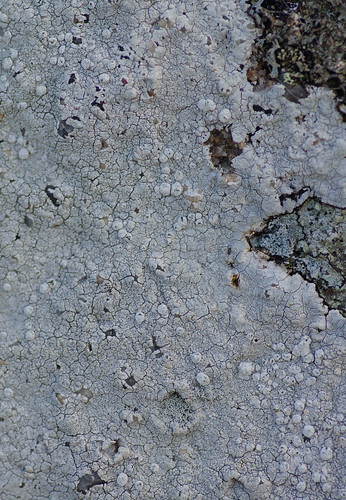 The usual conundrums appeared when looking at crustose lichens on rocks. 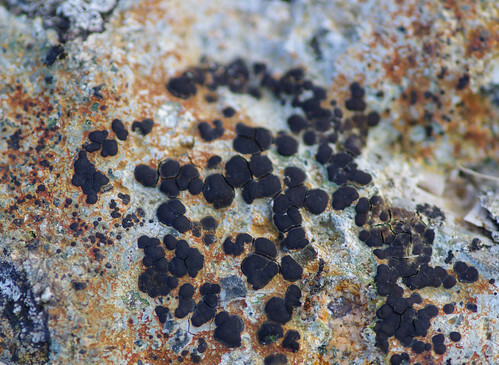 Black apothecia, chalky, cracked-white or grey thallus with a thin black prothallus. Initially, I plumped for Fuscidea cyathoides. 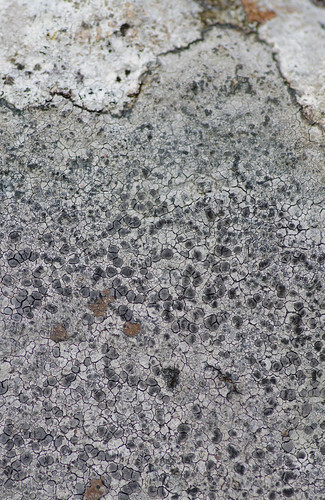 But I think it more likely to be one of the Porpidias, possibly Porpidia speirea. Chemical testing and microscopic analysis of the spores might give the answers but I'm not inclined to go around spraying diluted bleach and I don't currently possess an electron microscope, either. As things stand, our methodology of identifying species from sight is bound to throw up plenty of mysteries, even as our knowledge progresses. It's just something we've learned to accept. And just because you don't know the label assigned to a species it doesn't detract from the beauty and fascination of examining them. Sometimes we even think of our own labels. Apart from the resmblance to marbled mint cake (I must have been hungry at the time) I don't have the faintest inkling what this one is. But it's certainly a striking texture. There's also something faintly kaleidoscopic about it. You could stare at the centre for a few moments and almost imagine the patterns swirling. 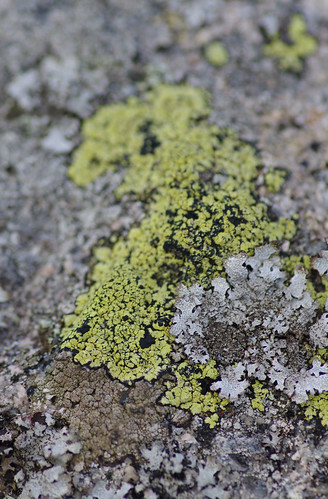 This is also known as the Map Lichen, due to areas of the thallus appearing like the land-locked borders of countries. 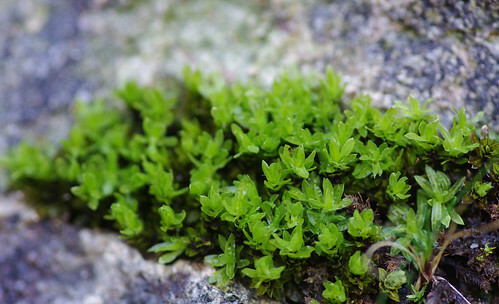 It is commonly found on granite boulders. Now that we've found it we'll be keeping our eyes peeled for a more impressive specimen. They can be yellow as here or slightly tinged with green. 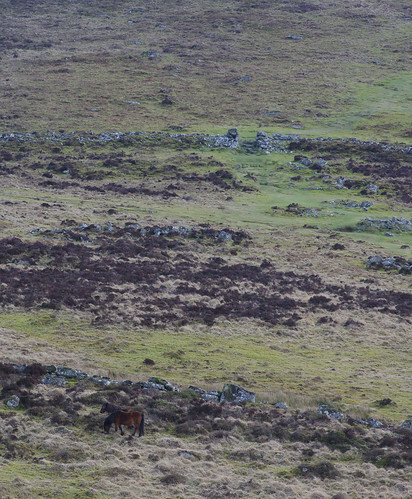 Dartmoor ponies were happily grazing just before the wall, oblivious of passing walkers, dogs and bikers. Sherry had to frame this shot carefully to avoid a lot of bright yellow cycling jerseys. 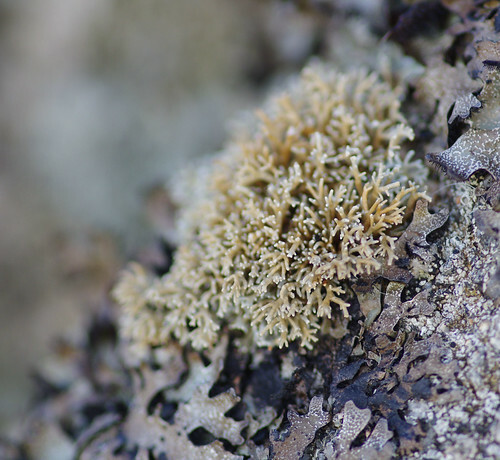 This was on a granite rock and was able to be identified from the yellowish tinge on the thallus. Because the rock was uneven I think the camera's autofocus got a bit confused. These granite boulders are a lichen-rich habitat. They are frequently finely balanced. I wonder if there are any local legends about giants with architectural pretensions! This is the remains of a hut. It had an entrance that would have been like a porch before the main living quarters. Walls were low and it's not hard to imagine the people who lived here huddled before the fire. Headland Warren Farm lies in the distance. On many farms rabbits were often kept in their thousands so that a plentiful supply of meat would be easily available all year round. As we left the pound behind we checked the rocks to see if there were any other new species. 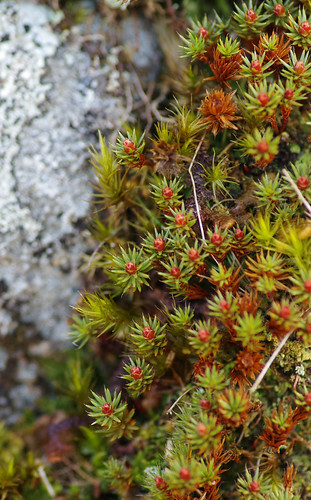 The rust-red stains on the thallus helped us single this species out from its relatives. The colour and shape of the basal squammules are the key here. They are arranged in an upright rosette. The podetia are irregular and misshapen. 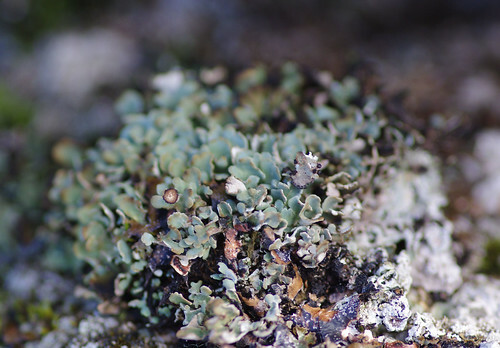 There are other similar species within the large Cladonia family but I'm reasonably satisfied we've made the right choice. Due to the orange-brown colouration this is probably Sphaerophorus globosus. 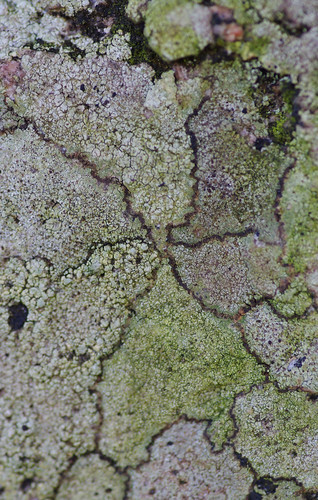 Unfortunately some of the Pertusaria lichens require chemical testing to be reliably separated. We were heading loosely cross-country, attempting to take the most direct line possible back to the road. Once reaching it we turned left and walked towards the next path junction for the medieval village of Challacombe. 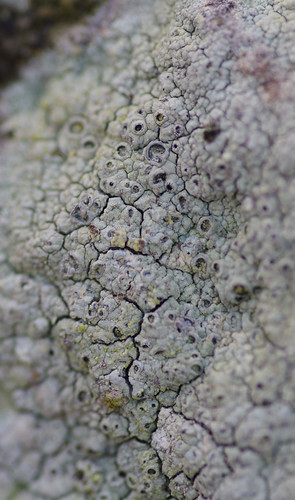 On every moorland walk I hope we will encounter the Dog Lichen. I thought I had found one on the roadside verge but it turned out to be the not dissimilar Peltigera membranacea. 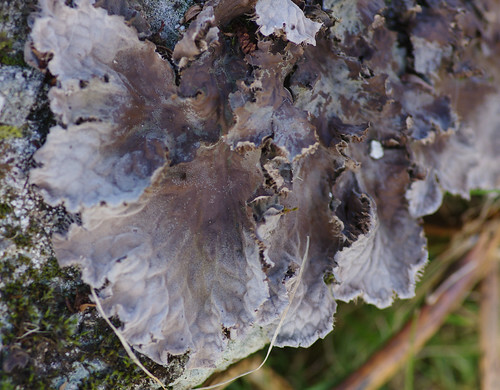 Dog Lichen (or Peltigera canina to use the Latin name) have more tufted yet compact rhizines under the lobes. Perhaps we will have better luck next time! These stems exhibited a faint two-tone pattern like crazy paving. Shortly after seeing this we turned right along a track, passing a low bridge with an unsual sign: requesting that you passed over quietly because there was a troll asleep underneath. A couple of years previously we had gone over in the opposite direction and lived to tell the tale. Lady had not been quite so lucky though. A ginger and white Papillon had taken exception to her presence and bitten her tail. When Lady squealed the Papillon then returned to apologise and gave her a parting kiss. This time we all kept an eye out for the dog. Lady saw it first and immediately put her tail down between her legs. The Papillon remembered her and came to rub noses. Eventually Lady's new friend went trotting back to its house and we continued on our way, taking the right fork at the next path junction. This was part of the Two Moors Way (Western Route) skirting Challacombe Down. As we neared a stream we stopped for lunch. The ruins of an old tinners' hut provided the perfect stop. We sat perched on a wall and noticed more specimens that required a closer look. 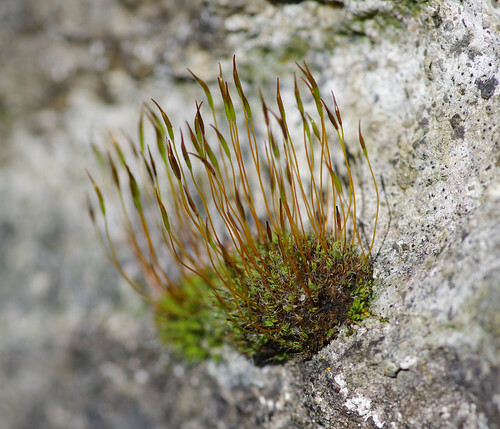 This is definitely filed under Pottiales in the mosses field guide but with dozens of similar species we were unable to choose just one winner. We've encountered this species before on our travels but Sherry managed to really nail it this time. The end result was achieved with a good deal of perseverance. There was a breeze blowing at critical moments. Between twenty and thirty shots did not come up to the standard above. After getting the desired result Sherry took a last turn round the walls of the building and we regrouped to resume our walk. Because of the number of images taken we have decided to split this walk into two parts. The second part will follow soon. 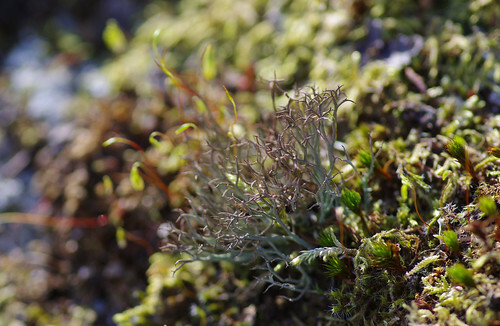 We would like to thank Jane Redman for joining this expedition and being incredibly patient while we inspected the usual miniature lichens and mosses with varying degrees of success.